Report: Dodgers co-owner Todd Boehly could leave Guggenheim group. Boehly — who helped pull together the complicated deal for the MLB franchise as the No. 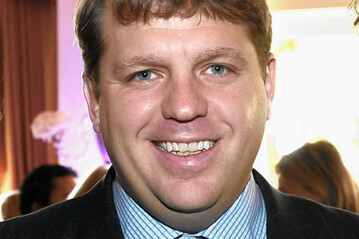 2 executive at Guggenheim Partners — is considering leaving the investment firm and running his own shop, according to sources. “Todd is exploring the possibility of owning his own firm, which would be focused on acquiring and owning private businesses and real estate,” said one source familiar with Boehly’s thinking. Another source said the discussions were at an advanced stage. “Todd is out, and they’re working on a way for him to exit,” the source said. The news comes two months after Korean-language website JoongAng Daily reported that a consortium of South Korean investors were seeking to purchase a 20 percent stake in the Dodgers. Forbes reported March 13 that a potential deal with the group was still on the table. Based solely on the timing of the news, it makes sense if Boehly’s share of the team was the portion going up for sale. Boehly helped get Time Warner Cable to bankroll the largest payroll in baseball history — a deal that was good for the Dodgers’ bottom line but so far bad for most fans, who cannot watch the team on SportsNet LA. Boehly reportedly contributed $100 million to the purchase of the club in 2012. Daily Distractions: Dodgers face an important roster decision. Expect the Dodgers to shed an infielder for this weekend’s series against the San Francisco Giants. Before we assume that Mark Ellis will be placed on the 15-day disabled list to make room for Clayton Kershaw, who must be activated from the bereavement list before he starts Friday, consider Ellis’ career numbers against the San Francisco Giants’ scheduled starters. He’s never had much success against Friday’s starter, Barry Zito (.217/.280/.304 in 23 at-bats). Yet Ellis has had no problems with Saturday’s starter, Ryan Vogelsong (.313/.313/.375 in 16 ABs) or Sunday’s starter, Matt Cain (.333/.385/.417 in 24 ABs). So if Ellis’ right quadriceps is healthy tomorrow — he wasn’t far off Wednesday — it’s entirely possible that the Dodgers would use him Saturday and Sunday and keep him on the bench as a late-innings option Friday. If that’s the case, look for the Dodgers to option Justin Sellers to Triple-A Albuquerque. Sellers is hitting .200/.278/.262. His slugging percentage is the fifth-lowest in the National League, just ahead of Juan Pierre (.253). The Dodgers don’t need a slugger at every position, but they’ve got an extra infielder if Ellis and Hanley Ramirez are both healthy. Sellers’ numbers could leave him the odd man out. A less likely move, if the Dodgers are so inclined, would be to designate Luis Cruz for assignment. Cruz hasn’t hit all season (.088/.117/.088), allowing Juan Uribe to surpass him on the depth chart at third base. While Sellers still has an option year to burn, Cruz does not, so this would be the most convenient means for removing Cruz from the active roster. It’s a rash move, sure. By designating Cruz for assignment, the Dodgers would risk losing him altogether when they could just as easily keep Sellers or Ellis in the organization. But it’s an option, and something to keep an eye on in the next 24 hours. Say hello to ‘SportsNet LA’. The Dodgers and Time Warner Cable officially announced the creation of a new channel, SportsNet LA, this morning. In effect, the Dodgers will be televised on their own regional sports network beginning in the 2014 season. The next challenge will be to secure distribution among the local carriers. TWC has already agreed to be the charter distributor throughout Southern California and Hawaii.